When Abraham was born, how old (or young) was the earth? Can we know the answer with confidence? Yes, if God has given us the information we need in Genesis. And He has. But to recognize it requires reading, writing, and 'rithmetic--and one more critical ingredient: avoiding the irrelevant issue of whether Genesis genealogies are "open" or "closed." Read that last sentence again; it is the key to avoiding confusion. Some people assume that the historical events related in the early chapters of Genesis cannot be precisely dated because we cannot be certain whether the genealogical lists are complete ("closed") or whether they skip generations and have gaps (and are thus "open"). The issue is irrelevant because the timeframes given in Genesis are measured by the number of years between one event and another event, regardless of how many generations occurred between those "bookend" events. For example, Genesis 5:3 states that Adam was 130 years old when Seth was "begotten." How old was Adam when he begot Seth? Adam was 130. Does it matter whether Seth was Adam's son, grandson, great-grandson, or an even later descendant? No, the answer is the same: 130. Seth's exact relationship to Adam is irrelevant because the timeframe is measured in how many years elapsed from one event (God creating Adam) to another event (Seth being begotten)--regardless of how many generations may have occurred between Adam and Seth. One obvious "wrinkle" in measuring the above timeframe involves the probable presence of a partial year, since Seth was not likely begotten on Adam's birthday. For a precise range to use in our calculations, we must consider that Adam was at least 130, but not yet 131. To allow for this extra time, we need to include a "partial" number in our calculation of not more than one year. That is why this study counts time with precision ranges…yet the ranges themselves are absolute! Genesis 5:3 ends with Adam begetting Seth (which likely refers to Seth's conception). The begetting of Seth also begins the next timeframe "link" in the unbroken chain of events from Adam to Abraham. At this point another range adjustment is needed to include the normal duration of a human gestation (i.e., "womb time") to take Seth from conception to birth. No gestation will take longer than one year, so an extra year of precisional tolerance is added to each timeframe that is bordered by a "begetting." A couple of our timeframes are not linked by a begetting, but by a geologic event. In Genesis 7:6, Noah's age at the time of the Flood is given as 600 years. Since the preceding bookend event was the begetting of Noah, the length of the timeframe connected to Genesis 7:6 will need to include a "womb time" of not more than one year (since Noah's birth started the count to 600 years), and will also need to include a "partial" amount of not more than one year, since it is unknown how much past 600 years old Noah was when the Flood arrived. Otherwise, it is straight event-to-event math, with the number of generations that are included between the "bookend" events being irrelevant. The 19 sequential links in this unbroken chain are given in the chart below. Therefore, the total earth-time in years from God's creation of Adam to the birth of Abraham cannot be more than 1,985 years, although it is likely somewhat less than that,5 yet it cannot be less than 1,948 years. Add 5 days,6 and you have the age of the earth when Abraham arrived here. It was a young earth into which Abraham was born--absolutely! 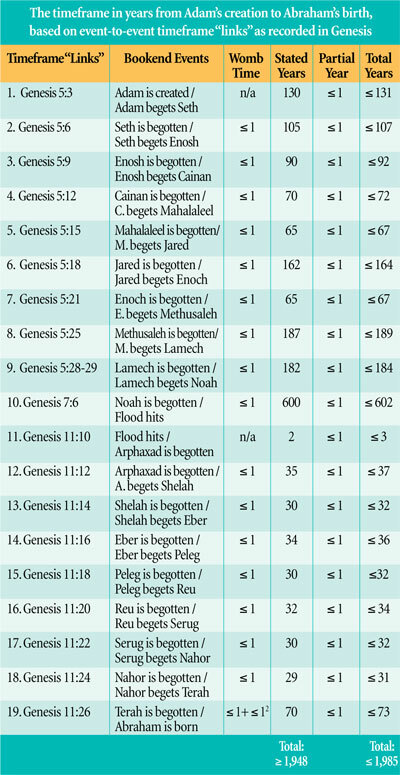 It should be noted that since timeframes 10 and 11 are linked to the "bookend" event of the Flood, the consideration of Noah's age at Shem's begetting and Shem's age at the begetting of Arphaxad is irrelevant. Gestation time is included for both Terah and Abraham, since the timeframe being measured is from Adam's creation to Abraham's birth. This parenthetical conclusion assumes that Abraham was born during the 22nd century B.C., which is not a controversial assumption among serious biblical history scholars, either liberals or conservatives. See, e.g., page 478 of The Genesis Flood by John C. Whitcomb and Henry M. Morris (Philadelphia: Presbyterian and Reformed Publishing Co., 1961), which suggests 2167 B.C. as Abraham's probable birth year. This article is an adaptation of a more detailed analysis by Thomas D. Ice & James J. S. Johnson (with preparation help from Dr. Bill Cooper) titled "Using Scriptural Data to Calculate a Range-Qualified Chronology from Adam to Abraham, with Comments on Why the 'Open'-or-'Closed' Genealogy Question Is Irrelevant," originally presented to the Evangelical Theological Society, Southwest Regional Meeting, March 1, 2002. A copy of this paper is available here on the ICR website. The range-qualified high is extra high, since adding a "buffer" of 1 extra year for every period of human gestation is overly generous--no mother would want a 12-month pregnancy! Adam and Eve were created on Day 6 (Genesis 1:23-31). * Dr. Johnson is Special Counsel at ICR. Cite this article: Johnson, J. J. S. 2008. How Young Is the Earth? Applying Simple Math to Data in Genesis. Acts & Facts. 37 (10): 4. Can the Ussher Chronology Be Trusted? Is Belief in the Young Earth Necessary to Be a Christian?